The excellent two minute debate about whether he should be left out of the starting XI to face Manchester United by Sky Sports News was simply thrilling, in that while the panel managed to point out some home truths about the player, they all seemed to miss the point somewhat. It was a brilliant display of how big generalisations about players lead to a misinterpretation of specifics in games. Phil Thompson opened with some general comments about Ozil and how he seems to be playing in areas of ineffectiveness, unable to force himself on the game in part because he drifts out of the action. I have to agree, he makes a good general point here. Ozil is exactly that kind of player: he is a space exploiter rather than a space creator, often drifting to either flank to find small pockets where he can devastate defences from unlikely angles. However the downside of this is that, yes, it does lead to him missing some of the thick of the possession battle. As a case in point, I return to my old favourite example of the 2011 Bayern Munich versus Real Madrid Champions League semi final in which Ozil let the game pass him by because he spent the entire game playing as a central winger while his opposite number Toni Kroos got more “stuck in” to the ball battle. So from a tactical point of view, Thompson makes a good point. But sadly, you do get the impression that he has some sort of agenda about how the German isn’t chest beating enough. His follow up example is that at Madrid, Ozil played closer to goal, linking up with Benzema and Ronaldo more instead of drifting “40 yards to goal” as he allegedly has at Arsenal this season. I have two problems with this: the first is that the notion of Ozil playing deeper at Arsenal is completely untrue. If we consult the average player position graphs for many of Arsenal’s games this season, we see he is often part of a fluid front 4 or 5 in line with the forwards, and not sitting deep in the middle of nowhere. In fact, against Liverpool in the League he was Arsenal’s most advanced player on average, running past Giroud holding the ball up to try and break space. The second problem is that this contradicts the first point. How can Ozil simultaneously be playing too deep and too far advanced, as Thompson’s comments seem to imply? Either he needs to try and get more involved, or he needs to continue his leave of absence but make his moments count, but the accomplishment of both would be virtually superhuman. If this sounds like a defence of Ozil’s recent performances, it is not intended to be. I agree as much as anyone that he needs to make his touches count more and that he has tended to enter a dangerously Arshavinesque drift. What I take issue with is the contradicting and under researched criticism. This brings us to Paul Merson’s response to Thompson, equally as insightful as it was bizarre. He explains that to do what Merson seems to suggest, to become more involved in a grinding-the-result-out sort of manner, is so far from Ozil’s nature that it would be ineffective: “he ain’t gonna go round kicking people, he isn’t gonna get sent off and walk off like the hard man”. It may not have intended to be, but it certainly sounded to me like this was a Rooney comparison. Okay, stereotypes about Wayne’s temper are somewhat unfair given how well and disciplined he has been in a frustrating season. But Rooney, playing in a similar position – the ever elusive to define number 10 role – has always been keen to stamp his authority on the game, almost at any cost. Originally this meant “even if he must get sent off”, but now it means “even if he loses his dangerous advanced positioning and becomes obsessed with stamping his personality at the expense of his talent”. Rooney’s main criticism is usually the opposite of Ozil’s; that he is so keen to have his presence felt that he often loses sight of his role, becomes distracted from the striker’s aims and becomes bogged down. In effect, the implication is that he needs to be a little more Ozil, focus on how he can hurt the opposition and find those dangerous areas to receive the ball in. I think there is a little truth in the notion that they could learn a thing or two from each other, but rather than debate which is right and which is wrong in the way that seems to have dominated the debate over the German’s form. Why can’t their different styles simply be appreciated? Though I doubt Rooney sees it this way, it comes down to an ideological and tactical question as well as the obvious personality difference: is it better to be always involved but not always effective, or always effective but not always involved? Not that Ozil is always effective, but he as tendency to try and focus on flashes of brilliance over presence, and when this doesn’t come off he loses form. If you asked him, I’m sure he would say he would rather be involved only for a few decisive moments than always playing but to no avail. Rooney on the other hand is a player who seems to prioritise involvement over effectiveness. Not to say that he is ineffective, but ask yourself how many more times you have seen him frustratingly lose sight of goal while sliding into players on the centre circle compared to seeing him let a game pass by without him being noticeable. In this sense it’s interesting that while Rooney is often referred to as a striker, possibly a hangup from his genuine striking days or a reflection of his impressive goal ratios, Ozil is forever called a midfielder. Given that it is Rooney, not Ozil, who is the more involved in the game as a whole, the more noticeable physical presence and even the deeper lying at times, it seems the wrong way round. But if there are different styles of playing every position, perhaps we should think of different positions of playing every position: in other words, is it the way both players play that defines whether they are midfielders or strikers, or is where they play? Are two players like Ozil and Rooney, playing in very similar areas of the pitch but in different styles, playing the same position? Or in actual fact, are two players like Pirlo and Goetze, playing similar through ball threading roles but at very different ends of the pitch, playing the same position? Big questions that Rooney, Ozil, Merson and Thompson are not going to help us answer today. But as a final note there is something of a myth about the chalk and cheese comparisons between the two players that tacticles my fancy. Rooney has won plaudits for his good form despite United’s poor season, while Ozil has been criticized for failing to capitalise on Arsenal’s good season to fire them to the title. I would argue that Rooney’s good form has been in part actually because of the sloppiness of the team around him: what better time to be the main man who tries to do it all than when the team requires a hero to do it all alone? 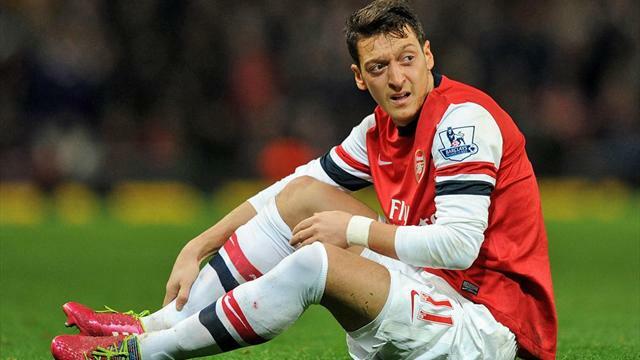 Meanwhile Ozil seems to feed off his own team’s fortunes, drifting in and out of form as the team itself does. While Rooney is seen as the selfless player, sacrificing himself for the team on a game by game basis in trying to do everything, he has ended up over the season coming out with personal glory while the team falters: his German rival has done the opposite, being singled out in poor Arsenal performances, and yet over the season he has effectively sacrificed his own reputation while Arsenal have just about kept on pace with the leaders. 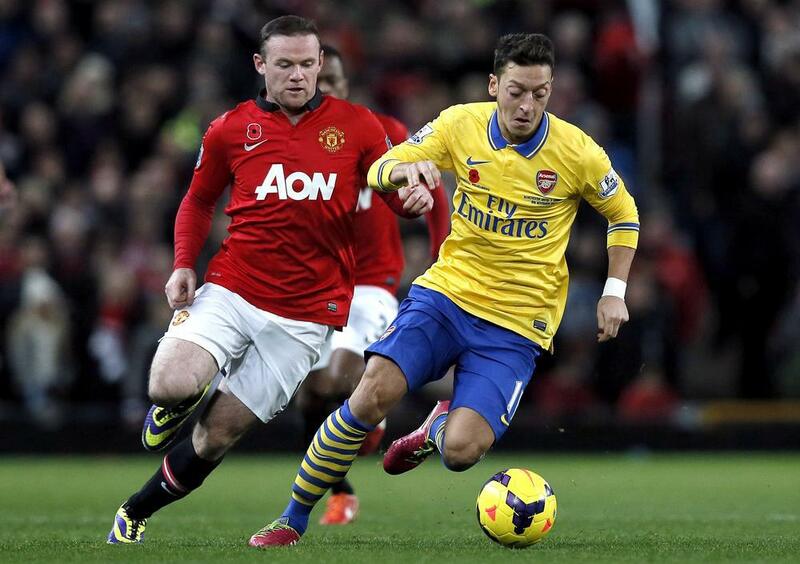 Is it a coincidence that what Rooney does on a game level, Ozil has achieved in a season-level? Or is it that, really, they are more similar than they appear, but with Rooney effecting the game in the micro level and Ozil on the macro? While the German lets games pass without forcing himself on them, when you think about Arsenal’s highs and lows this season, he’s always there. He picks his moments and on a seasonal level, he is ever preset. This is why Merson was quite right to say that he must play. It is right to question his work ethic, it is right to say he can learn from Rooney, and it is certainly right that he needs to stamp his personality on games more. But it is also true that he sees games in a different level, that we may never understand the scrolling matrix of green numbers that he sees football in, and that he probably knows himself that Rooney is less his opposite than his kindred spirit. This entry was posted in Tactics and tagged arsenal, manchester united, mesut ozil, paul merson, phil thompson, wayne rooney by Simon Smith. Bookmark the permalink. One of the best football articles I’ve read in a long time. Insightful, nuanced, intelligent. Well done.